The concept of online ads is nothing new. It has been around for the last two decades. It is considered to be direct response process of advertising. But, it is only recently that the character and the form of the ads have changed and become more customer oriented. The click through rate of the first banner ad published in the year 1994 was about 44%. This rate has only deteriorated over the last few years. The advertisers today need to do something extra to ensure that the ads become appealing to the customers and they get engaged with it. 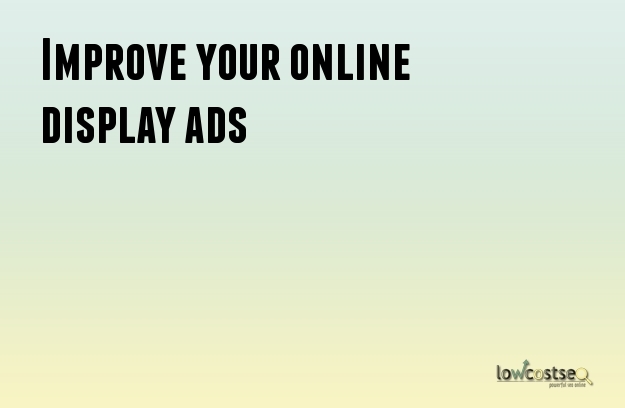 Some researches show that display ads have a varying degree of influence when it comes to making decision. The ad makers must take certain steps to ensure that the customers get properly influenced and the ad does its job properly. ·Make the ad influential: Research shows that the users often backtrack while purchasing the product finally. The ads may encourage the viewers to visit the page, but nearly 40% of the people do not end up purchasing the product at the end. You need to make the advertisement more influential and come up with more creative messages. This way your target audience will get more attracted to not only the ad, but also the product that is being marketed. You can also includes phrases like ‘for limited time only’, ‘while the stocks last’, etc to create a demand among the users. It is better to not include the prices in the advertisements. ·Make the ad relevant: Make sure that you target the relevant audience. If you randomly pick an audience for your advertisements that are not relevant to them, you will not get any results from it. Targeting audience, rather retargeting them by the user history is a good way to find out their interests and likes. ·Target the younger generation: It is proven that the audience belonging to a age group 18 to 25 are more likely to be influenced by the advertisements. They are also likely to purchase the products more than the people of older age group. The older generation is also less likely to notice the advertisement. Hence, if you are targeting the older audience, you need to come up with a certain new techniques in order to make them notice. Parallel campaigns with traditional methods of advertisements are better suited for the older audience. ·Make the advertisements attractive: This goes without saying that you need to make the ads catchy if you want it to make impact on the audience. Especially, if your target audience is younger, you need to make it even more attractive and colorful. ·Gender Influences: It is seen that the women are more influenced by the display ads than the men folk. Men are more likely to go for the offline mode of advertising for making the purchasing decision. Keeping this in mind, chalk out your ad campaign. Be specific about the audience that you are targeting and then decide on the method.